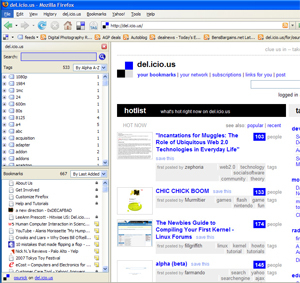 Social bookmarking service Del.icio.us has one of the more popular Firefox Add-ons, but until recently it didn’t sync with your account and bring bookmarks and tags to the browser. A few months ago they quietly released a new version that basically takes over the Firefox bookmarking function, but it wasn’t syncing fast enough for power users. Today they’ve updated the Add-On, and they’ve solved the speed issue. If you are a del.icio.us user, this will become your most-used Firefox Add-ons. If you aren’t one of the 2 million people using Del.icio.us yet, this may be the reason you start. Download the Add-on here. My biggest complaint about Del.icio.us over the last couple of years has been that it is often too slow. That led me to switch to Bluedot.us, a worthy competitor. But Del.icio.us has made significant speed improvements recently, and this new Add-on is incredibly useful. I’m back at Del.icio.us. Currently Del.icio.us only allows bookmarks to be public or private. I’m hoping they’ll soon allow users to share bookmarks with friends only, which is sort of in between.